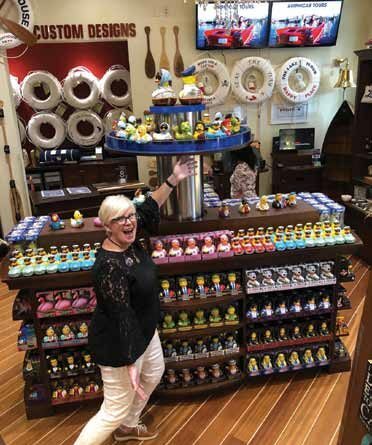 Rae M. Olson, director of retail merchandising, The Boathouse Orlando in Windermere, Fla., photographed with a display of Celebriducks. From versions depicting the Blues Brothers and Charlie Chaplin to James Brown, Celebriducks have become popular at gift shops around the country. 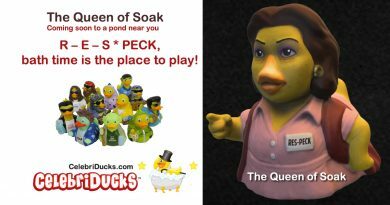 The concept – a rubber duck that looks like a celebrity – seems simple enough, but the artistry that goes into making these silly toys has made them a fan favorite. And for good reason: the ducks are cute, funny and very reasonably priced. 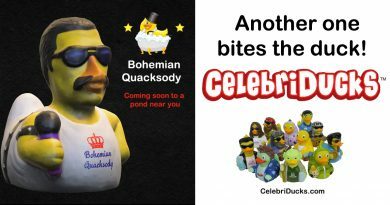 Collectors have even begun cropping up in hopes of finding the funniest, coolest and most unusual Celebriducks on the market. Entertainment Weekly even included Celebriducks among its top 100 gifts of the year. Though The Boathouse itself is an upscale nautical-inspired concept that combines shopping and dining with gorgeous waterfront views, the gift shop features a range of products from the more sophisticated (engraved paddles, apparel and jewelry) to more whimsical items like lake-themed gifts and notecards. The vibe here, says Olson, is “upscale and fun with authentic nautical-themed products.” The ducks, as it turns out, fit right in. Customers, said Olson, seem to love that there are always new famous faces to choose from, and that all pay homage to celebrities the most humorous ways. “The ducks,” said Olson, “make a great gift for collectors and duck enthusiasts. And the styles are also on-trend.” They come in a range of styles and categories that span entertainment, sports and politics, and even college mascots.